"This was the plan from the beginning. This is why Adrian brought Pius and the neocats to Guam. David and Adrian knew of Tony Boy's history with boys. And just as Tony Boy used his predecessor's history to manipulate his own episcopal appointment, Adriana, with the aid of the filthy impostor, Putrid, had in mind the same." - Tim Rohr, THE FILTHY IMPOSTOR AND THE PLAN FROM THE BEGINNING, JungleWatch, 25, 2017. What did Apuron know about Flores that allowed him to be his successor? Is there an earlier post about this? No earlier post. But many know. Tim, are you and others mum on Archbishop Flores' knowledge / involvement so as not to tarnish his reputation? If he had a hand in this travesty, why not let it be known?? As with every other priest who has been accused, I let the victims do it first. Are there any local priests not stained by Apuron and Flores? If Adrian knew about Apuron, then the others did too. Three Bishops something very wrong here. And Adrian who knew the situation did all he could to take advantage. Tim is getting closer to the story but as always there will be more victims to come. Evil to unfold. These three sic bishops formed a pact to protect each other. Flores had a clear direction as to what he was doing. To answer 2:49pm. Interesting question. By the use of your word "stain" you may mean sin.The stain of sin passed to Adrian David. It would be foolish to say no others possibly knew. Situation much more complex than black white. I would say that local priests suffered some quietly because of Apuron Flores. This is a very complex situation. We cannot assume. More to the point there were also seminarians priests who questioned what was happening. A person who questioned them were silently removed made out to be bad guys. So I ask you to please be very sensitive in this area. 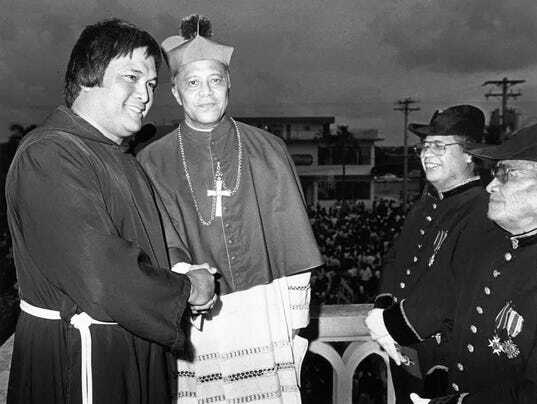 I would say only two priests used the information to gain power over Apuron to carry out their agenda which was to appoint Adrian as Archbishop of Guam.A seminarian or a priest who was a threat to Adrian would not last. He would make their life hell. Even in 2000 Adrian Pius Apuron and another were prepared to kill to keep their dark secrets. Exactly what I was thinking of Tim... and I wonder what more we will hear about these stories in Guam because the rot is just as deep and dark. Hello! Hoping and waiting from the Dianas. LOL. What need is there for forgiveness if Apuron is innocent?